For almost two years, East Sussex County Council (ESCC) has been repeatedly telling us that the link road would be opening in May 2015. Indeed, it said so on their website – that is, until we put this post up, when the opening date was suddenly changed to the rather more vague ‘summer 2015’. Those of us who’ve watched the progress of the road, in particular the slowing of work last winter due to flooding (the rain dance worked!) have been waiting with bated breath for the moment when they’d admit that, ahem, actually, they’re behind schedule. That moment seems to have come, although ESCC has not seen fit to announce it in its usual manner, with a press release trumpeting the news. In fact, had some of us not gone to the recent construction exhibitions to ask a few probing questions, we’d be none the wiser. 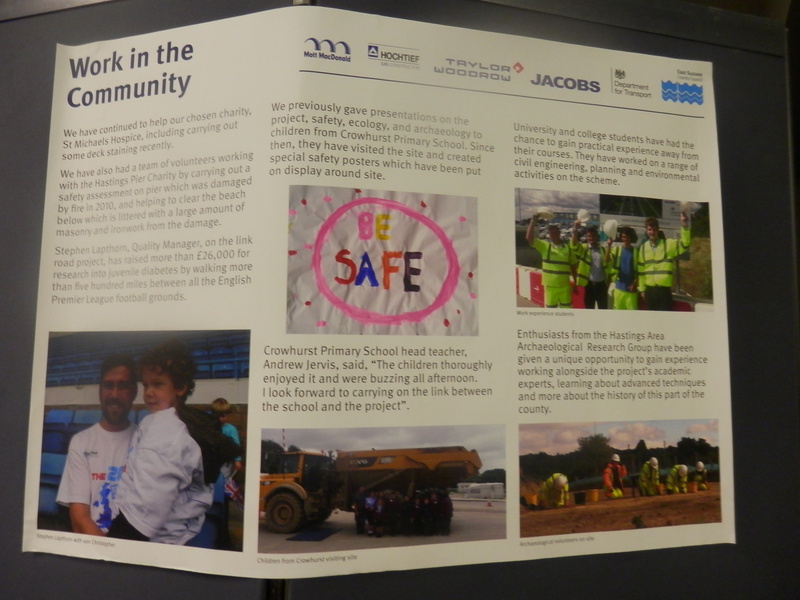 A colleague had attended the exhibition at West St Leonards community centre (we would never say that they hold the exhibitions in inaccessible places and at times when most people are at work, in the hope that nobody comes) and been told that actually the road wouldn’t be opening in May as planned. He asked how long it would be delayed but was met with what one might call fudging. Us: Will the road be opening as planned in May? Us: And will that be May? Us: Our colleague was told at the exhibition two days ago that it definitely wouldn’t be opening in May. The official line, restated several times, was that ‘We’ll finish as soon as we can’. There’s a radical idea. Chloe de Renzy Martin explained that it was taking longer than anticipated because there were ‘more items on the critical path’ (no, us neither). We were keen to ask about the budget: surely if the construction period was extended, the cost would rise? No, Bob Pape said, they still had some of their contingency fund left. We asked if he thought they would need to go back to ESCC to ask for more money and he said that he was ‘bullish’ that that wouldn’t be necessary (as an aside: bullish is defined by the OED as ‘aggressively confident and self-assertive’. It’s an interesting choice of words, and not a million miles from a similar word we might use to describe everything we were being told). 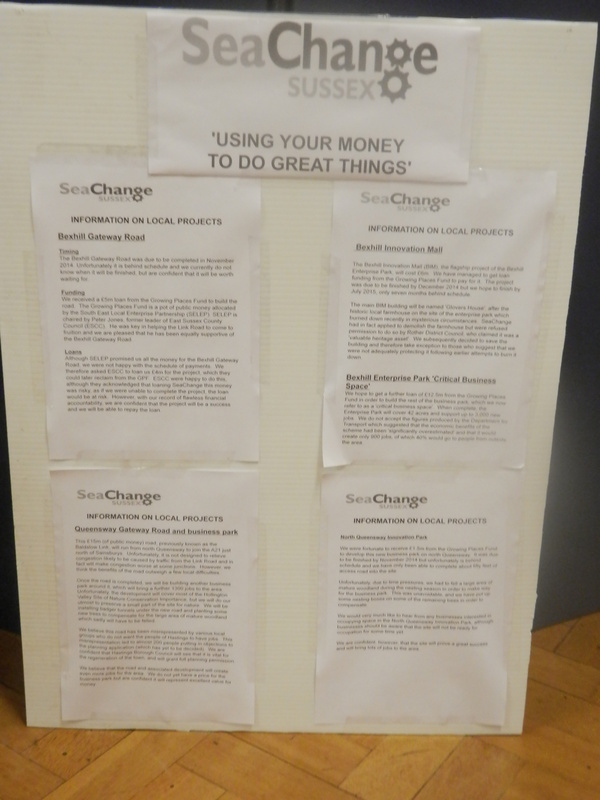 Something else we were keen to know was why SeaChange were not at the exhibition. They attended the first two (although had to run away from the one last December after being asked some questions by CHD) but were nowhere to be seen this time or last. We felt their attendence was crucial, as the whole reason for building the link road was to allow SeaChange to build a vast business park (sorry, ‘critical business space’) over the countryside north of Bexhill. 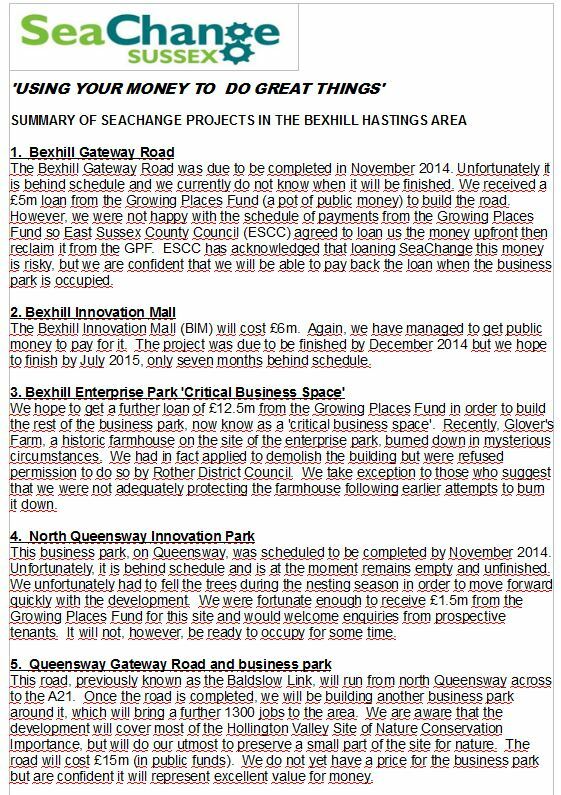 Their current construction work on the Bexhill Gateway Road is very likely to be causing headaches for a lot of people who live in the area, who might very well like to ask SeaChange a few questions. But it was not to be. Chloe de Renzy Martin said that there had never been any intention for SeaChange to be there, which was slightly at odds with another member of the team (they really need to brief these people about the party line) who said that the issue of SeaChange being there had been raised, ‘but I don’t know what happened with that’. We felt this was a community-minded thing to do, to give people information that they otherwise wouldn’t be privy to (you can see the information in full: Bexhill Gateway Road, Bexhill Enterprise Park, North Queensway, Queensway Gateway). 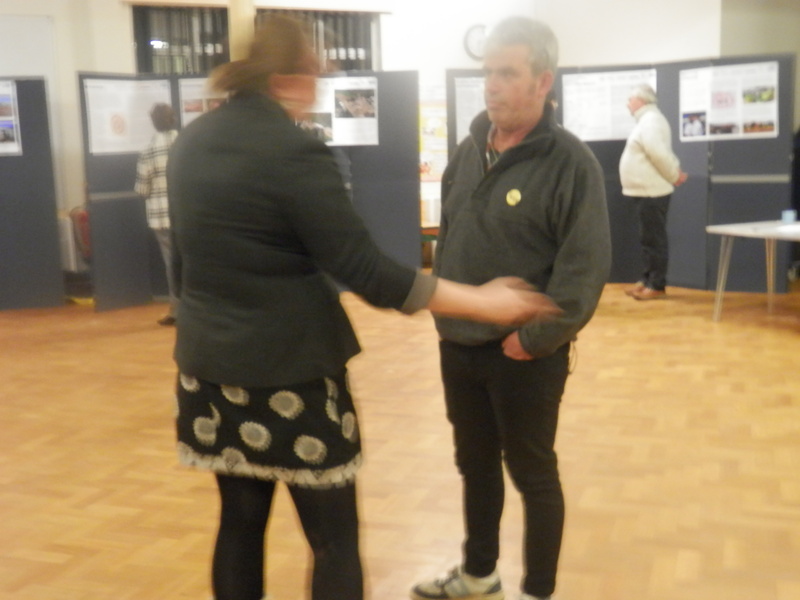 However, Chloe de Renzy Martin had other ideas and repeatedly turned our poster face down so nobody could see it. When challenged about this denial of free speech, she said we couldn’t show our poster because we weren’t paying for the hire of the hall. We pointed out that as East Sussex residents, we were certainly paying for it, but that cut no ice. She clearly saw it as her job to police the information that people received. Those who prefer buses to cars will be pleased to know that ESCC is now ‘definitely planning’ (according to Bob Pape) to run a bus service along the link road. This is an improvement from last time, when he would only say that it was an ‘aspiration’. However, he still refused to say for definite that there would be a bus service running from the opening day. Chloe de Renzy Martin was keen to point out that they had been in talks with Stagecoach about how the service could be made ‘commercially viable’. This, she said, was a Very Good Thing, as it would mean that if the county council had to make cuts to bus services, that one would be secure. That ESCC could spend £56m+ on the road, yet not be prepared to spend a tiny fraction of that subsidising a bus route, pretty much says it all about their priorities. So there you have it. The road won’t be opening in May. SeaChange are nothing to do with it. They’re bullish. There could be a bus. And if the road doesn’t open in May, there’ll be another of these farcical exhibitions to attend. « Hollington Valley treedressing, Saturday 6 December: join us!